Niklas Larson, 9 months, and his sister Annika, age 3, attended Dr. Packard's lecture with their mother, Missy Larson. 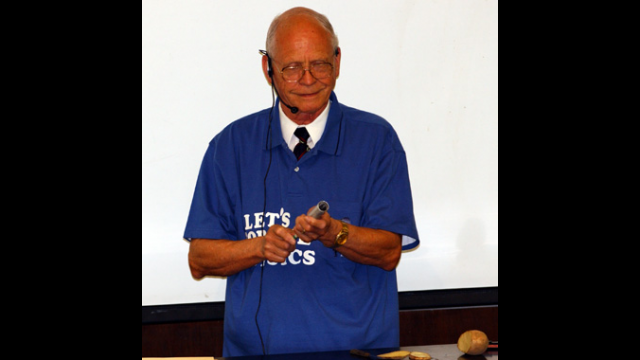 Using a metal cylinder and a pieces of a potato, Dr. Packard demonstrates the physics behind the Heimlich Maneuver. During the 50 years physics professor Robert Packard has taught at Baylor, he has often thought the college students in his classes were getting younger and younger. But even Packard must have said "Good grief" to himself on May 3 when he looked out on the crowd gathered for his Physics 1405 lecture and saw 3-year-old Annika Larson and her baby brother, Niklas, beaming back at him from the front row. So why were the tots attending a college physics class? Their mother, Missy Larson, took "Packard Physics," as the course in known, in the 1980s. When she heard that Packard will retire this month, she was determined that her children could one day say that they heard a lecture by the much-loved professor. "Dr. Packard was my favorite professor," Larson said. "He makes physics so entertaining. He is just such a special part of Baylor and I wanted Annika and Niklas to experience that." It might have appeared to an outsider that Baylor's renowned professor put on a show especially for the children, but just like it was just business as usual for the man who is determined to bring fun into the classroom. During the class, he demonstrated various physics principles. Using a cylinder and pieces of a potato, he showed the physics behind the Heimlich maneuver; with an egg and some bubble wrap, he explained the resiliency and the fragility of the human skull; and he enlightened the class on the cause of the collapse of the World Trade Center by explaining the properties of metal when used in architectural design. "Physics is loaded with all kinds of practical applications, but I think that sometimes my students remember the demonstrations instead of the principles," Packard said. Annika and Niklas weren't the only guests Friday. Several science majors, who were required to enroll in more-advanced physics courses, sat in on Packard's lecture. Senior Jacob Rucker, an aviation sciences major, has attended Packard's course all semester. "I'm in a [calculus] based physics book, but I asked Dr. Packard at the start of the semester if I could sit in. I wanted to attend every class. Packard physics is a Baylor tradition -- you can't have gone to Baylor without taking it. It is a rite of passage," Rucker said. "We never got to take him, but he is a staple here. We had to crash one day. We wanted to give him our support because he always gives students his support," said Tiffany Driscoll, a junior physics major from Spring, Texas. Packard said his imminent retirement has not yet sunk in. "Every year is sad for me when the kids I have known for four years graduate," he said. "This isn't any different than what I experience every year. I think I will be nostalgic when I have a brainstorm on an idea I could use in my class, and then it will hit me that I won't have a class to teach." Packard and his wife, Joyce, plan to travel after his retirement. The couple has participated in alumni college trips to Ireland and Switzerland and will journey to Washington and Lee University in Virginia this summer and New England in the autumn for a tour of the fall foliage. A veteran of World War II, Packard is a Phi Beta Kappa graduate of the University of Texas, where he earned three degrees in physics while working on naval research. He has been a professor at Baylor since 1952 and served as chairman of the physics department from 1981-1993. He was designated a Master Teacher in 1990 and has a lecture hall at Baylor named in his honor. 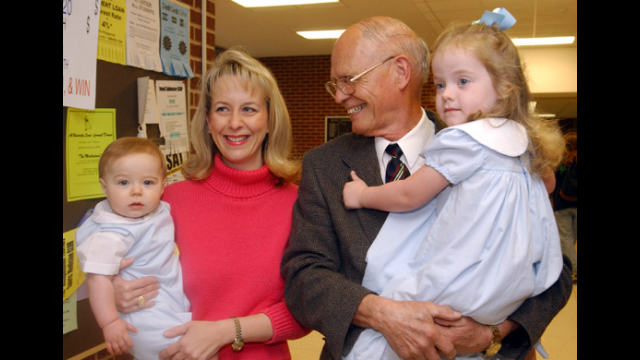 In 2001, the senior class selected him as the Collins Outstanding Professor. Packard said he has a host of memories to take with him from his 50 years at Baylor. "My students actually arranged my first date with Joyce, who was Baylor's assistant dean of women. My class also once hired a belly dancer to come in while I was lecturing, and during the Christmas season, Santa Claus would make a visit to my class. Kids are just fascinating, and I have loved every moment," he said.